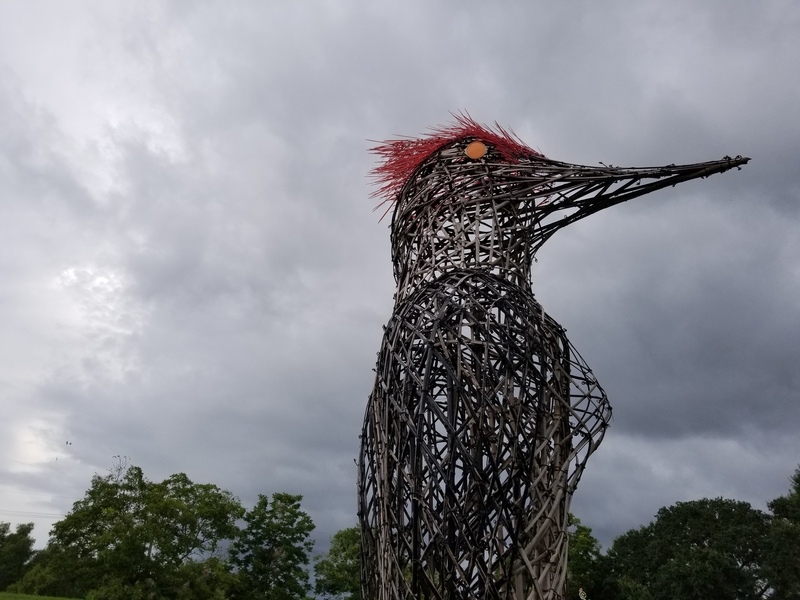 One of the things you will first notice approaching the at Crevasse 22 | River House in Poydras, Louisiana is the assortment of constructions dotting the yard, including a large, wood-entangled sculpture of a woodpecker. Sprinkled red paint on top its hollow head and orange eyes gazing outward, this organic monument from artists Donna Dodson and Andy Moerlein— which is meant to deteriorate over time— could be seen as a thesis statement for all the art on display: the beauty and risks of nature. “The idea is to emphasize the environment though art and also to give art the space to breathe in a beautiful setting,” says Jeanne Nathan, Executive Director at the Creative Alliance of New Orleans and founder of Crevasse 22 | River House. When Nathan came back to New Orleans after a long career focused on marketing and public relations in New York City, she was interested in advocating for the arts in the city. This led her to co-found the Center for Contemporary Arts, as well as CANO. “I’m the type of person who says, ‘well, let’s not fuss, let’s do something!’” she says. In 2014, when Nathan was invited by Sidney Torres III and Roberta Burns of the Burns-Torres Trust, to try and create something interesting with a property they owned in Poydras, she jumped at the opportunity. “I came out here one day for Prospect 3, looked around and said, ‘let’s do a pop-up sculpture garden and see what happens!’” says Nathan. It ended up being a smashing success with over 1,000 people making the trip to St. Bernard Parish for the last day of the showcase. Management of water and disaster are written into the history of the area with marks from the infamous flooding of 1927 on the Mississippi River— and the man-made devastation wrought on St. Bernard Parish— and the destruction of Hurricane Katrina still resonating throughout the landscape and community. Crevasse 22 | River House actually gets its name from a tear in the banks nearby that happened in 1922, which flooded the immediate area and created a lake that leads into Bayou Terre aux Boeufs. These moments define the area in many ways, and the art center and sculpture garden present a way for artists and viewers to talk about them and to think of what will come next. Crevasse 22’s last Summer Second Sunday event will be held September 9th from 11AM – 4PM. Crevasse 22 is located at 8122 Saro Lane in Poydras, Louisiana, over in St. Bernard Parish. More information about the art center and garden be found on their Facebook page and on the CANO website.